Saba is no longer able to make her parents happy with her childlike joys. She is now in bed staring into space. It is too early for Saba to be bed bound in childhood, too early…. 2007 reminds Saba’s parents of the days from then Saba could no longer share her childhood happiness with her parents. The days that Saba went to the hospital with her foot and although her health improved which made her parents very happy, but suddenly everything went wrong. That just ruined their dreams and their daughter never laughed again and could no longer make her parents happy with her sweet language. Saba went to the hospital with his foot but returned home not the same way. I was supposed to go to Saba’s home in the afternoon and meet her parents. Their home was near Shiraz-Bushehr police station. When I reached there, Saba’s father walked out of the house to welcome me into their home. On our way, he told me how they live in their rented place with lots of difficulties and as they’ve had to sell all their belonging to fund treatments for Saba, it is now extremely difficult for them to pay their rent as well as their living costs. As soon as I entered their home, the first thing that I saw was Saba. She was lying in bed while staring into space. When I went near her bed, I wasn’t sure whether she would notice my presence or not, but it seemed that she noticed that her parents have a gust. Her mother said “dear Saba, we have a guest here, are you happy?” Her mother said: “dear Saba, if you are happy then close your eyes an open them again” and Saba was glad. Rather than being in year 4 at school these days, Saba is now lying in bed and experiencing the other side of life. It is very difficult for her parents that they can’t even cry in their home as Saba’s doctor has told them that she is aware of her environment to some extent, therefore they should avoid making the home atmosphere sad and heart-rending. Saba’s father talks about those distressing days, when Sabas was recovering but suddenly everything went wrong and Saba never smiled again. He talks about the days when he was forced to sell one of his kidneys to pay for Saba’s expensive medical treatments. Saba staring at her dad and it looks like that she is thinking of the days that she was supposed to go to school, to make friends and to experience the real taste of life. Saba’s father describes the incident as follows; Saba started the nursery in September 2007 but since January 2008, her headaches started, therefore we sought medical treatment. 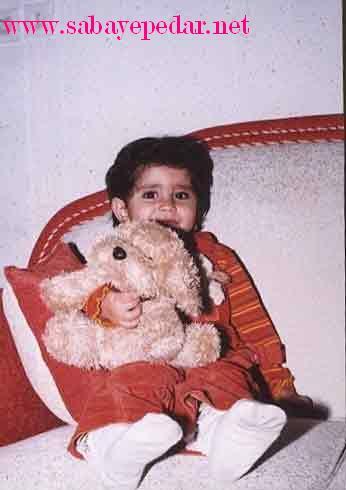 She was first wrongly diagnosed with Sinusitis, but as she had persistent headaches and started developing Strabismus, therefore we sought medical treatment again and eventually on 26January 2008 she diagnosed with Cerebellar tumour with elevated intracranial pressure and therefore she had to have immediate surgery. 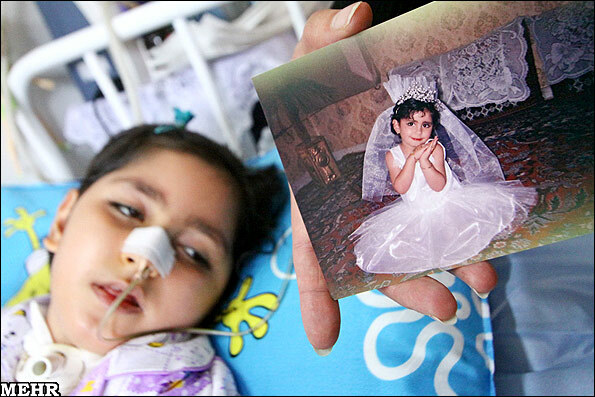 On 29 January 2008, she underwent shunt placement surgery in order to relieve increased pressure inside the skull. On 2 February 2008, she underwent operation to remove the tumour which was successful and she only had to undergo radiotherapy in order to kill any remaining tumour cells. Saba was discharged from the hospital after a couple of days and she was doing very well. After a few days her doctor suggested that she needs to be operated again as the shunt is not located in the right position. On 16 February 2008, she underwent shunt replacement surgery but as her surgeon wasn’t satisfied with CT scan result, therefore on 17 February 2008 she was taken to the operating theatre for the forth times. Although the surgeon still wasn’t satisfied with the location of the shunt but they discharged her from the hospital after a couple of days. After that Saba had 33 radiotherapy sessions and her doctor was so satisfied with the results, as there wasn’t any sign of tumour progression. She then had bone marrow biopsy and the results didn’t show any sign of bone marrow metastasis. Afterwards chemotherapy sessions were started and she had her first chemo session on 20 April 2008 and the second session on 21 May 2008. After a couple of days her shunt stopped working so we took her to the hospital. They did few tests in the hospital and informed us that we would not have to worry and they discharged her after 24 hours. After a couple of days her health condition became worse therefore we took her to the hospital again but there were only resident physicians available at that time as doctors were away for holiday. They admitted her to the hospital and after they realized that the problem is due to the abdominal shunt, they took her for operation one more time. Unfortunately the operation wasn’t successful and she also started having abdominal pain. After performing more operations without any benefits, they discharged her although she was still suffering from abdominal pain. The next day her health condition became even worse so we took her to the hospital again and they admitted her to the hospital and she underwent surgery one more time. But unfortunately the operation wasn’t successful again and she also developed Meningitis. After performing 11 operations by resident physicians during that period, Saba’s doctor came back from holiday and performed another operation on her which was successful and all of her vital signs returned to normal. 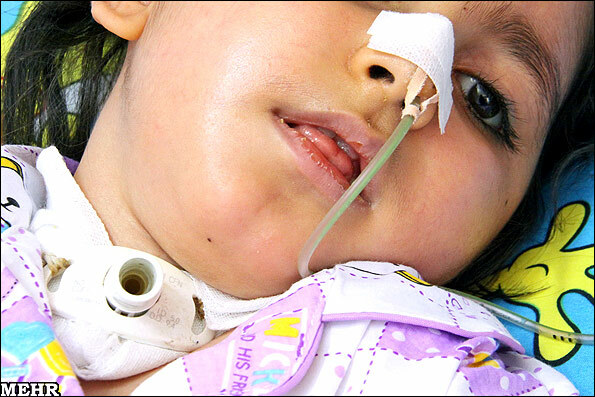 During 4o days of admission in ICU, Saba developed pressure sores on her leg. Also, due to the aspiration during operations which were done by resident physicians, tracheostomy tube was inserted for her by first year resident which was against the rules. Despite all these complications, Saba was doing well and all her vital signs were normal and she was supposed to be discharged from hospital in couple of days. But unfortunately everything went wrong again. On 10 July 2008, when one of the nurses was replacing the gas under the truck, the truck moved out of its normal position and that made Saba very uncomfortable. At that time Saba’s mother was with her but she couldn’t calm her down. Mother was ordered to leave the room by the nurse. Despite her desire to say, she had to leave her tearful daughter. Unfortunately the nurse didn’t bother to find out the reason for her uncomfortness as she was busy preparing for shift change. Around 7 o’clock in the morning we were informed by one of our friends, to go to ICU immediately as Saba wasn’t feeling well. When we got there we managed to get into the room although they were trying to prevent us from doing so. As soon as we entered the room we saw her bruised and swollen body. When we asked for explanation, they told us that her tracheostomy tube moved out of position and they couldn’t adjust it and as all other resident physicians were taking exams at that time, we missed golden time. Although staff nurses knew that lack of Oxygen would cause serious complications but Saba suffered hypoxia for about 20 minutes. They had to resuscitate her 5 times but she suffered brain injuries that left her in coma. The following day she woke up from coma and her intelligence quotient raised from 3 to 5. The ventilator was removed as she could breathe on her own. After 10 days they discharged her from the hospital while she was in a vegetative state and from then we have been looking after her at home. Thank God Saba came out of vegetative state after two years and two months and we should be hopeful and optimistic, according to her doctor. Regarding our situation, we have been also communicating with various authorities, but they didn’t pay any attention. In order to pay for Saba’s treatment, we had to borrow large amounts of money and I had to sell one of my kidneys and although I have official evidence confirming that, but they accused me of extortion and they claimed that my intention was to attract help from overseas. Saba’s father ended his conversation with me. I looked at Saba and I felt that she has noticed what we were talking about. I saw her staring into space an hour ago, but now I could see some changes in her eyes, I could see sadness in her eyes. It looks like that she can feel the pain that her dad has been going through. I felt that she is also worried. It is too early for Saba to be bed bound, too early….